Over the past year, the Department of Labor has increased its emphasis on enforcement measures as part of its new strategy called “Plan/Prevent/Protect”: The Beginning of a Broader Regulatory and Enforcement Strategy. In keeping with those efforts, the White House recently announced an unprecedented collaboration between a federal agency and a private bar association. Starting Monday, the DOL’s Wage and Hour Division will work with the Standing Committee on Lawyer Referral and Information Service of the American Bar Association. Workers who contact the Division may now be referred to “qualified private-sector attorneys” to handle their cases as private actions. The Wage and Hour Division is responsible for enforcement of the Fair Labor Standards Act and the Family and Medical Leave Act, among other laws. According to the DOL, this new joint effort was precipitated by the Division’s inability to handle all the complaints it receives. Even though the Division has hired 350 new investigators during the past two years, it has been unable to assist all of the more than 35,000 workers who seek its assistance each year. Moreover, it could not ensure that the workers it could not assist were able to exercise their private rights of action under the FLSA and the FMLA. 3. The Division will also initiate “a special process for complainants and representing attorneys to quickly obtain certain relevant case information and documents when available.” It is not yet known whether the documents may include the employer’s confidential or proprietary information, or whether they will be disclosed without prior notice to the employer. All of this means that employers will undoubtedly face an increase in private lawsuits alleging FLSA and FMLA violations. Particularly “hot” areas include independent contractor status, pre- and post-work time, meal periods, white-collar exemptions, and tipped employee requirements. 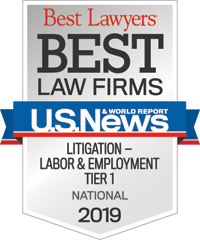 These trends are expected to continue as more potential plaintiffs are connected with private wage and hour attorneys through the DOL-ABA collaboration. The collaboration also obviously provides attorneys with the tools they need to file class actions and collective actions: clients and valuable information obtained by the DOL through its investigative authority. Employers will now have to give careful consideration to whether the information and documentation they provide to the DOL will be made available to private plaintiffs’ counsel without the protections and filter of the Freedom of Information Act. In light of these significant changes, it is more important than ever for employers to act now to ensure their business practices are not in violation of the FLSA or FMLA. If you have a question about the DOL-ABA collaboration or are interested in an audit of your wage and hour practices, please contact Ellen Kearns or Jim Coleman, any member of Constangy’s Wage Hour Practice Group, or the Constangy attorney of your choice.